Below is a schedule of the informal LASP Magnetospheres Seminars for the spring 2009 semester. Except where noted, seminars will be held on Tuesday afternoons in room LSTB-206 at 3:30 pm. Abstract: An overview is presented of Grad-Shafranov (GS) reconstruction and MHD reconstruction methods that can be used in different physical circumstances to reconstruct two-dimensional (2D), time-independent field and plasma structures in space. The reconstruction methods are based on integration of the applicable plasma equations describing the equilibrium, with initial inputs from spacecraft data, starting from the spacecraft path through the structure. The integration can be performed up to a limited distance perpendicular to the path and various 2D maps of the structure can then be obtained. The GS reconstruction is aimed or cases where inertial effects can be neglected and the structures are governed by the GS equation, and the MHD reconstruction is based, not on the GS equation, but on a direct integration of the ideal MHD equations. In the talk, benchmark case and application will be shown for each reconstruction method. 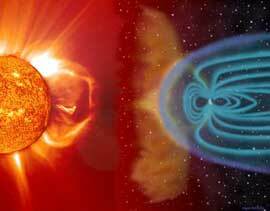 Abstract: Magnetic reconnection plays a central role in a wide variety of observed solar and space phenomena. In the solar wind magnetic reconnection commonly occurs in a quasi-stationary mode at extended X-lines. It produces Petschek-like exhausts of roughly Alfvenic jetting plasma bounded by back-to-back rotational discontinuities or slow mode waves that bifurcate a reconnecting current sheet. It occurs most frequently in low beta plasma and at thin current sheets associated with relatively small (less than 90 deg) magnetic field rotations. Reconnection exhausts are observed most frequently (40-80 events/month at 1 AU) in the low-speed wind and within interplanetary coronal mass ejections, and less frequently in the Alfvenic turbulence characteristic of the high-speed wind from coronal holes. Reconnection occurs relatively infrequently at the heliospheric current sheet (HCS), but observations of exhausts at the HCS are particularly revealing of the magnetic topology changes associated with the reconnection process. Reconnection in the solar wind is usually "fast", but not explosive – the magnetic energy release occurs over a long time interval following reconnection as the Alfvenic disturbances initiated by the process propagate into the surrounding solar wind plasma. Interestingly, there is as yet no hard evidence that would indicate that reconnection in the solar wind ever produces substantial particle acceleration. This paper provides a brief update/overview of magnetic reconnection in the solar wind as revealed by observations of reconnection exhausts. April 21, 2009 Phase space density radial gradients of relativistic electrons beyond GEO: Further evidence of acceleration by wave-particle interactions? Abstract: Flickering aurora is the most rapidly varying auroral phenomena with intensity variations at frequencies typically between 5 and 20 Hz. The horizontal scale size of flickering columns are typically 1-10 km. Here we use high-speed narrow field-of-view imaging in white light to determine the spatial motion of intensity variations centered around magnetic zenith. The temporal variation of the spatial structures are compared with theoretical predictions based on interference between electromagnetic ion-cyclotron waves (Sakanoi et al. 2005). In addition spectral observations of flickering aurora in different auroral emissions made with the ASK multi-imager instrument will be presented. The ratio between the flickering amplitude in the 777.4 (atomic oxygen) and 6730 (O2+, N2) vary with the flickering frequency. This shows that the characteristic energy of the electron precipitation varies with frequency in a manner similar to what would be expected from electron acceleration by Alfvenic waves. Simultaneous with the optical observations, measurements with the EISCAT Svalbard Radar was made in the direction of the magnetic field. Incoherent scatter radar data is noise-like, and must be integrated over multiple pulses to reduce the variance to useful levels, even for high signal to noise ratios. Usually, this means integrating over several seconds to some tens of seconds of observation, which is not very useful with respect to flickering aurora. In the experiment presented here, we have taken data at the voltage level, before any integration. By doing so, we are free to define integrations which are not necessarily contiguous in time. We have used the intensity variation of flickering aurora within the area of the radar beam to define local temporal origins, and have integrated together pulses with the same time offset from the nearest origin to investigate whether radar back-scatter varies in a way which is correlated with the variation in optical emission intensity. This way we can determine the ionospheric response to the temporal variation of the electron precipitation at time-scales of 0.01 s.